The masters of the short-form album return with another winning EP. 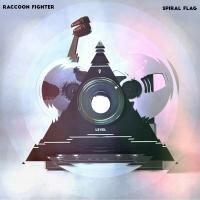 The guys in Raccoon Fighter (Zac Ciancaglini, Sean Gavigan, and Gabe Wilhelm) are masters of the short-form album. Zil, their first LP, came in under 25 minutes. Their entire discography—three EPs, an LP, and a 7"—could basically fit on a single CD-R. This is all upside: they never overstay their welcome, and they leave fans wanting more. This was particularly true after Zil came out in 2013. That album was lauded by critics for its exploration of various avenues of garage/psych/fuzz/blues rock with tinges of surf pop and British Invasion. Spiral Flag sits comfortably in this same musical vein, just leaner, the band punching consistently in their guitar/drums/baritone guitar (hence the tinge of surf) wheelhouse. Even the track titles find them cutting the fat: "15 Minutes", "Mr. Cool", "Hotwire"—not a "Down and Out in a Diamond City" to be found. While it doesn't build on Zil's sense of exploration, Spiral Flag's heaping dose of reverb, simple hooks, front-and-center drums, and fuzzy garage vocals provide further evidence that these guys are capable of knocking out a few solid tunes at will. Much like the diminutive garbage-prowling thief from which they take their name, Raccoon Fighter sneak in, get the job done, and are gone before you even realize what's happening.